There are 2 adjustment knobs in this unit, one is for adjusting nitrogen pressure and the other one is for adjusting the damping force. The compression and rebound damping settings can be adjusted separately, and above-mentioned adjustment knobs can be adjusted separately as well; There are 864 different settings to adjust. The best part of this item is to extend the amount of oil and nitrogen gas which can increase the stability of the shocks and prevent the shock oil temperature too high from being exhausted after long-term use. This kit is only produce for D2 VIP and it can relate to the real tuning issue to develop and produce case by case. Only D2 sole distributor have the ability to purchase this kit. The coilover used particularly in track, rally asphalt, drifting, 0-400M drag race specs. We will have the dyno graph for each coilover with nitrogen reservoir. 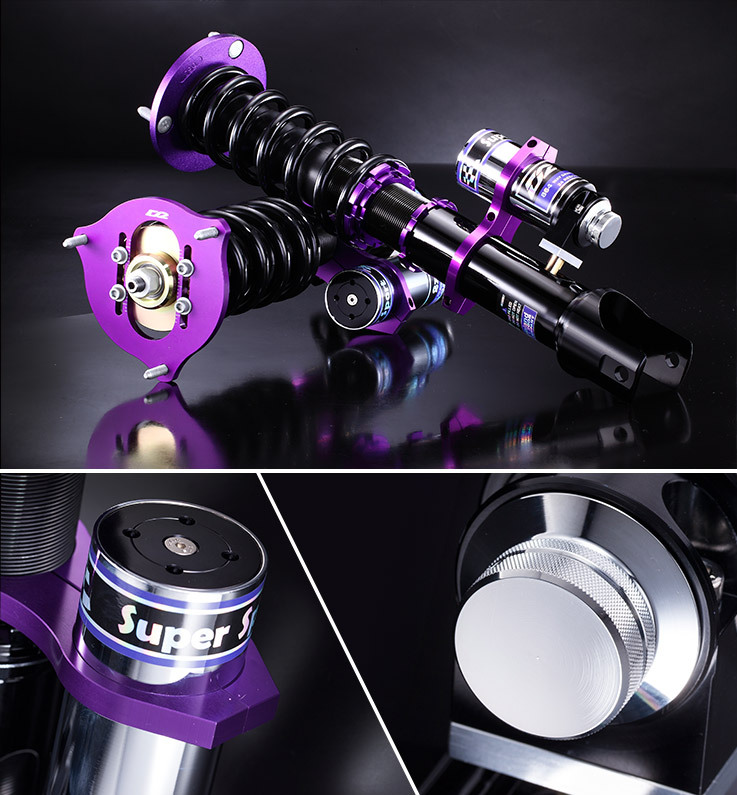 Super sport suspension kit is made specifically for your personal use so both front and rear struts are marked as "★"
The spring rate of Super Sport is designed for performance car, it comes with 2~3 kg/mm stiffer spring rate and 60~150% harder damping force than Street setting. It’s suitable for track day use and drivers who value street performance.